Monocular Telescope 50% OFF With Code!!! 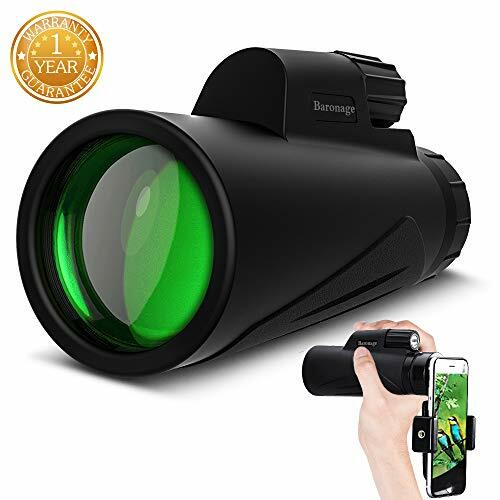 Monocular Telescope, Baronage 12X42 High Power BAK4 Prism Monocular Scope Stable Smartphone Tripod Phone Mount Adapter, Handy HD Imaging Adults Bird Watching Camping Travelling. ☛【High Powered Magnification】: Monocular magnifies at 12 times your normal eyesight, 42mm objective lens optical technology provides wide field of vision and excellent light performance. ☛【High-definition Image】: Equipped with fully multi-coated green lens and BAK4 prism, enhances resolution and contrast, ensures more realistic colors and HD images with better light transmission. ☛【Wide Compatibility】: Perfectly Compatible with iPhone X, 8/8plus, 7/7plus, 6/6s/6plus, 5/ 5s/se, Samsung GALAXY S8/7/6, Edge, Note, Google Pixels, LG, HTC, Sony and so on. ☛【Reliable Quality and Warranty】: 30-day money back and 12-month free warranty come with this product. Please feel free to reach our friendly customer support.